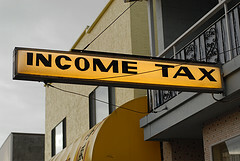 The latest Income Tax operation is one of the biggest operations in the recent period. More than Rs.92 Cr was recovered by the income tax department. The operation included some six major real estate developers and two leading advocates of the city. Sources close to the Income Tax department reveal that the operation started on 26th of December, 2012. Investigation wing of the income tax department conducted the raids at the same time in several places. They conducted the operations in many groups so as to avoid all chances for the builders to escape. They had conducted raids in Adajan Patia, Pal, V Arachha, City Light, Ghod Dod Road and Vesu- the places where the realty builders and the lawyers reside. The investigation wing surrounded the offices and residences of these builders and lawyers. Nearly 19 bank lockers belonging to the developers were detained. The department seized Rs.1.3 Cr out of the Rs.1.5 Cr found in cash. Income Tax Raids on Builders: Nearly Rs.100 Cr will be recovered. A senior official said that the department expects to recover nearly Rs.100 Cr from the developers. He said that the department still continues assessing 12 bank lockers belonging to the developers. He added that only after the completion of accessing they can say anything further about the development. The latest raid on the developers is the third biggest raid conducted in the year 2012. Previously, the Income Tax department had recovered Rs.127 Cr from some real estate builders of the city. While this remains as the biggest the second biggest raid recovered Rs.111 Cr a logistic firm. This entry was posted in Real Estate News and tagged Income Tax department, Income Tax investigation wing, Income Tax raids, real estate builders, Surat, unaccounted money by designer. Bookmark the permalink.